SMEs still rate Switzerland as a broadly attractive business location. They are nevertheless pessimistic about the future when it comes to regulatory framework conditions and the economic environment. More than 99 percent of Swiss firms are SMEs, and together these firms account for nearly two-thirds of all jobs in Switzerland. As part of the "Success Factors for Swiss SMEs" series of studies, Credit Suisse economists conduct an annual analysis of Switzerland as a location for business as well as the framework conditions from an SME perspective, based on a large-scale survey. The main topic of this year's study is investment on the part of Swiss SMEs. On the whole, the SMEs questioned this year once again rate framework conditions in Switzerland as being conducive to success. The SMEs believe the factors infrastructure and employees/qualifications have a particularly positive influence on business success. However, the SMEs' overall assessment of Switzerland as a business location has deteriorated slightly compared with the previous year. The appreciation of the Swiss franc since the abandonment of the EUR/CHF exchange-rate floor is having negative effects: By and large, SMEs view the impact of the economic environment and Switzerland's international ties on their success this year as negative. Regulatory framework conditions are once again judged to be an impediment to success. 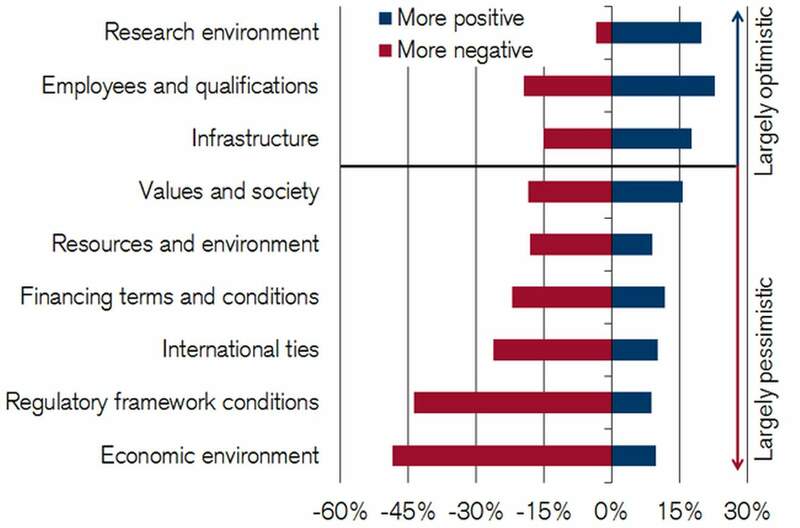 In terms of the economic environment and regulation, many firms expect a further deterioration in future. In light of these views, the issue of easing the regulatory burden on businesses needs to move higher up the political agenda if Swiss SMEs' chances of success are to be secured – particularly in a more troubled economic climate. 90 percent of the SMEs surveyed made investments between 2009 and 2014, spending an average of 10 percent of their sales. Investment as a proportion of sales was highest in the case of service-sector companies (16 percent) and the high-tech industry (10 percent), and lowest in retail (5 percent). Real estate was the biggest area of investment with a 47 percent share of the total, followed by equipment (42 percent). The survey also shows that real estate investment has gained importance for all sectors in the last six years. In particular, SMEs from the tourism and entertainment sectors, as well as the healthcare, education and social services sectors, were above-average investors in real estate; high-tech industry, on the other hand, spent an above-average proportion on research and development. Just 6 percent of all SMEs surveyed invested abroad between 2009 and 2014. The survey shows that SMEs believe the Swiss franc's appreciation in January this year is likely to be more difficult to absorb than that seen in 2010/2011. 40 percent of all SMEs surveyed expect sales and margins to fall following this year's Swiss franc appreciation, with 30 percent anticipating a decline in competitiveness. 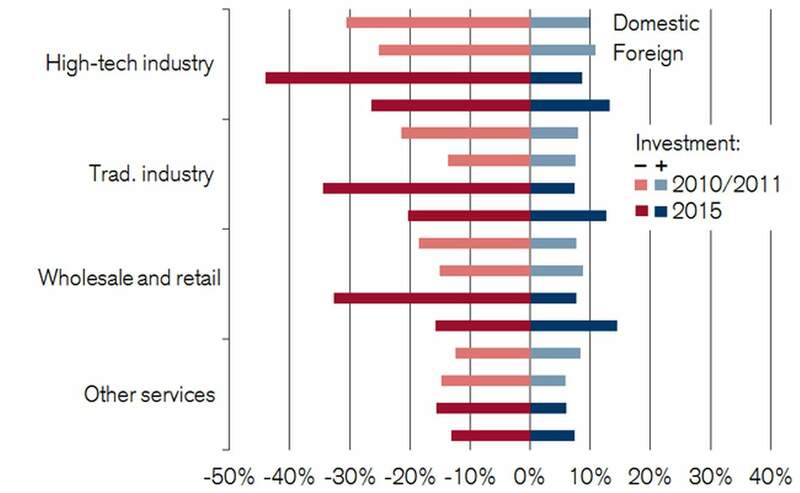 SMEs in the industrial and retail sectors in particular are under strong pressure. Although 72 percent of the SMEs surveyed are sticking to their investment plans despite the strong Swiss franc, 20 percent are planning a reduction – and in the high-tech industry the figure is as high as 44 percent. According to the survey, those SMEs that are reducing their investment due to the stronger Swiss franc are more export-oriented than those SMEs whose investment is unchanged or increasing. In addition, SMEs that are planning a reduction in investment due to the strong Swiss franc are more likely to expect the currency's appreciation to have a negative effect on sales, margins and competitiveness than the other SMEs. The results of the survey also show that diversification in the form of strategic interests and cooperation agreements to some extent alleviates the negative effect of Swiss franc appreciation on SME investment. In addition, the margins and competitiveness of Swiss SMEs that invested abroad between 2009 and 2014 are less frequently affected by the current strength of the Swiss franc compared to SMEs that only invested domestically. 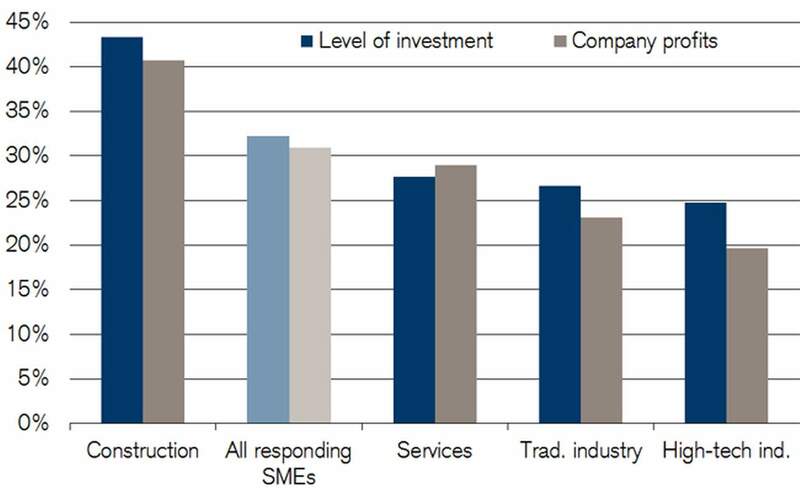 According to the survey, Swiss SMEs mainly use cash and traditional bank loans to finance investment. In the case of young businesses, non-bank loans also play an important role. In overall terms, the multi-year spell of low interest rates has provided only a moderate boost to SME investment activity: Nearly one-third of the SMEs questioned indicate that low interest rates between 2009 and 2014 had a positive effect on the level of investment; more than 60 percent said they had no influence. One reason is likely to be the fact that uncertainty about the future course of the economy often plays a greater role than financing conditions when it comes to investment decisions. The situation appears slightly different in construction, which has benefited from low interest rates in two ways: As well as lowering firms' own financing costs, low interest rates and the attendant cheaper mortgages have increased the demand for real estate and therefore construction services. For 73 percent of the SMEs surveyed, the replacement of outdated infrastructure was an important motive for investment in the 2009–2014 period – no other reason was more frequently cited as important. 65 percent of the SMEs described improved efficiency as an important reason to invest – and among the industrial SMEs surveyed it was the most frequently as important cited reason for investing. According to the survey, measures to boost efficiency and maintain competitiveness are likely to gain importance for Swiss SMEs in 2015 and 2016. 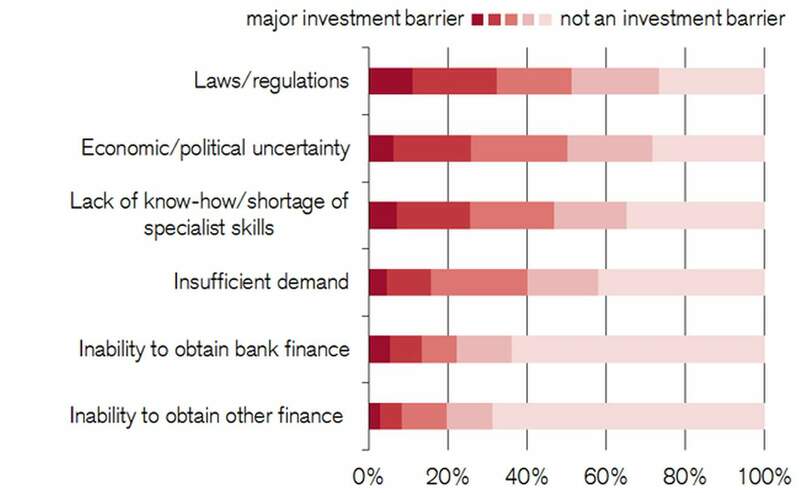 In line with the results regarding success factors, regulation is a big obstacle to investment for the SMEs surveyed: Around one-third of SME respondents stated that laws and regulations had severely hampered key investment projects in 2009–2014. For more than one-quarter of the SMEs surveyed, economic and political uncertainty as well as the shortage of specialist skills were major obstacles to investment. A total of 58 percent of the SMEs were unable to execute substantial investment projects as planned between 2009 and 2014; this was due to insufficient demand, economic and political uncertainty, regulation, a shortage of specialist skills, or – if in significantly fewer cases – a lack of finance. A total of 23 percent of the SMEs in the survey stated they were satisfied with their investment activity as well as the sales and margins generated in the 2009–2014 period. The results of the survey show that these SMEs in particular invested more heavily in employee training and research and development than companies that were dissatisfied with either their investment activity, their sales or their margins. In addition, their investment activity was less frequently hampered by political and economic uncertainty. The success of Swiss SMEs is therefore founded on three key pillars: qualified employees, innovation and stability. According to the survey, SMEs are thoroughly aware of the crucial importance of human capital. Four-fifths of the SMEs surveyed have invested in the training of their staff in the past six years. While companies are able to influence the employees and innovation factors themselves, Credit Suisse economists would urge politicians in particular to improve stability and planning security for Swiss SMEs.